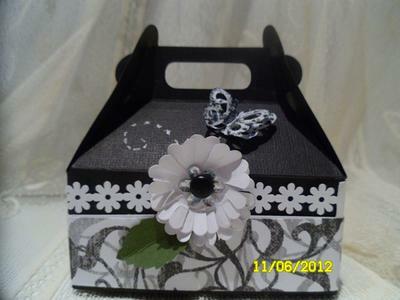 To make all my little boxes, I cut with Sizzix-Box Carry All with the BigShot! After I place all my pieces, glue white super strong tape two faces. 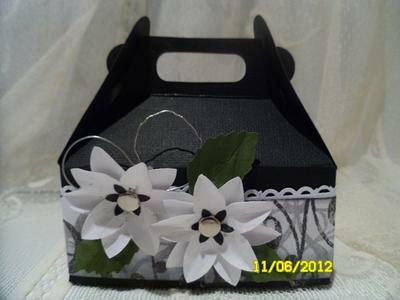 I make flowers to decorate it, foliage, pearls or other embellishment! It's a good idea to give a little gift and you can put chocolate in the box....anything you want to please! This is lovely way to give a little gift and a chocolate sounds just perfect. It is also a good project to use for wedding favors and would look really good in the wedding colours that the bride has chosen and laid on the tables at the reception. Thank's each of you! I appreciate all your comments!! 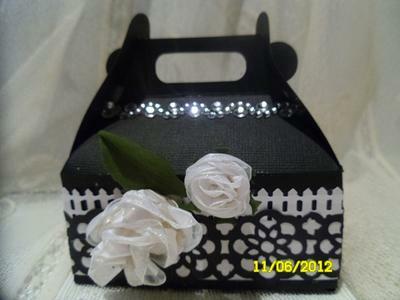 these are absolutely gorgeous love the black white and red theme.i agree with christina about them making lovely wedding favour boxes. Thes boxes are so different.